Carpenter Bus Sales understands that adding exterior graphics to your bus can be an easy and affordable way to gain name recognition and exposure for your church or organization. Your vehicle becomes a rolling billboard every time you take your bus out. This is a VERY cost effective way to allow people to hear about you without breaking your advertising budget. For example, adding your website to your bus, gives people the ability to find you online and learn all about your organization. The choices of lettering and logos are almost limitless. We can help facilitate anything from a simple single color lettering on the bus to full color body wraps. We have had lettering and logos applied to thousands of buses over the years. Depending on your organization, whether you are a local church, a senior living community, or a limousine company, we have plenty of examples of the lettering and graphics that have been applied so you can have an idea of what your bus might look like. At your request, we can provide a visual of what your bus will look like with your lettering on it. As a rule of thumb, most of our customers use a three line lettering design on the sides of their bus. Several of those customers will also add the lettering to the back of the bus, but the basic three line lettering per side is by far the most popular package. The vinyl lettering is applied below the windows on the sides of the bus towards the front of the vehicle. We literally have thousands of fonts at our disposal, so matching the fonts for your organization should not be a problem at all. For our customers who require more, we can accommodate. We have also applied full color body wraps on vehicles. 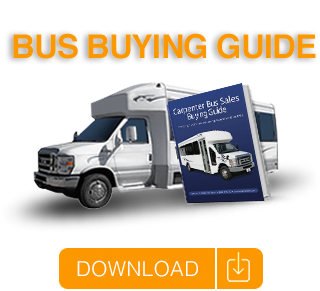 Contact Carpenter Bus Sales today to discuss any of the buses for sale in our inventory and how to use one to reach a greater audience for your church or organization. Call us today at (800) 370-6180.